TACLOBAN City — House Independent Minority leader and Leyte Rep. Ferdinand Martin Romualdez yesterday vehement by objected to the plan of President Benigno Aquino III to transfer the Daniel Z. Romualdez Airport. In a press conference here, Romualdez said it is better for Aquino to first improve the condition of the Ninoy Aquino International Airport, which was named after his father, before looking at the other airports in the country. 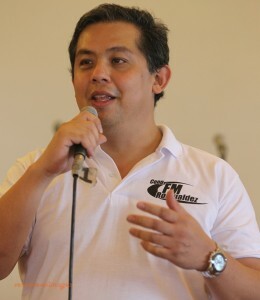 Romualdez expressed disappointment over some international media reports that NAIA is among the worst airports in the world. “We should remind the President to focus on things that should be done first. Bakit hindi muna pagandahin ang NAIA, nakapangalan na nga sa tatay niya,” Romualdez said. “Sabi nga ng report, pinakapanget, pinakawalang kwentang airport ang NAIA. Dapat ito muna ang unahin,” he added. The solon suspected that there is politics behind the plan of Aquino to transfer the Daniel Z. Romualdez Airport from Tacloban City to Palo, Leyte. Meanwhile, Mayor Alfred Romualdez said the Japan International Cooperation Agency (JICA) denied reports that it conducted study for the transfer of Daniel Romualdez Airport. “I’m just curious on who did the study? Just one outfit? And the problem, JICA texted me, I have communication from JICA, that they are not doing any study, in fact their recommendation is to retain the airport, and we talk to CAAP, it is the same thing,” Mayor Romualdez said. Mayor Romualdez said the government should first consult all the major stakeholders including the local government before issuing any decision on the matter. “Basically, what I’m saying is that I’m not against the transfer of the airport. I’m saying that we don’t come to make rash decisions. We have to look at that very carefully because it will affect not only the economy but it will cost billions of pesos,” he said. ”So ang sinasabi ko lang, pagka gumawa ka ng planong ganito, dapat my consultation, lahat ng stakeholders tinatawag, pinag-uusapan yan,” he added. President Aquino had said that Daniel Z. Romualdez Airport in Tacloban City might have to be relocated either to Palo or Sta. Fe, Leyte since the current location of the airport is prone to storm surge even if breakwater is constructed. The President even said that the possible relocation of the airport is based on a JICA study.